Middle East Perspectives by Rick Francona: Iranian diplomats at July 4 parties - why not? The U.S. State Department sent a cable to its embassies around the world authorizing American diplomats and attaches to invite their Iranian counterparts to July 4th celebrations. The Independence Day event is usually one of the highlights of an American Embassy's social calendar. Normally, invitations to embassy and other diplomatic missions' social events are restricted to representatives of nations with whom we have diplomatic relations. We do not have diplomatic relations with Iran, and diplomats and attaches from Iran are not invited to American functions. They have not been invited since we broke relations with Iran after Iranian students seized the American Embassy in Tehran in 1979 and held U.S. diplomats and attaches hostage for 444 days. The restrictions also determine what military attaches can wear. 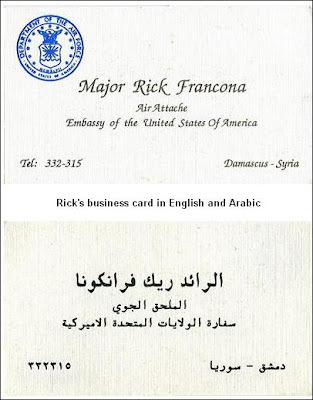 When I was the air attache to the American Embassy in Damascus (click for pictures), Syria in the early 1990's, our office would routinely receive instructions from the Defense Department on what we were to wear to receptions and functions. For example, the Chinese embassy (located across the street from ours) hosted a cocktail party on their national day. We were instructed to attend, but to not wear our uniforms. Normally on a national day reception, we would wear our formal dress uniforms as a sign of respect. Showing up in a civilian suit sent a message. I was surprised that the Chinese defense attache, a brigadier general, called me aside and asked why I was not in uniform. People do pay attention to these details, pay attention to the subtle message. Likewise, an invitation to an Iranian diplomat or attache will also be noted. The reversal of longstanding State Department policy is no doubt part of the Obama administration's attempt to reach out to Iran. I will not address the the wisdom of that overall policy here, but on the local level, the diplomatic functions where American diplomats and attaches can meet their Iranian counterparts, it is welcome. It is important that U.S. government representatives can meet and talk to their Iranian counterparts. In many instances, there is valuable, useful, actionable information to be gained. If we cannot talk to the "bad guys," how do we intend to beat them?